Cozmoslabs is focused on delivering premium WordPress plugins you can rely on. Follow this blog to know more about Cozmoslabs WordPress Plugins & Solutions. Looking for the best WordPress member directory plugin to showcase the users at your site in a public list? In this post, we go hands-on with 5 great options to help you find the plugin that’s right for your unique situation. …basically any website that allows user registration! There are a lot of benefits to adding user profiles to your site. As long as you have a flexible user listing plugin, you’ll be able to include your own user roles and profile fields, along with custom search and filter options. Profile Builder is a user profile plugin that, in addition to helping you create custom user profiles, can also help you display those profiles in a front-end member directory. One of the nice things about this plugin is that you get a lot of options for which users show up in the directory and what information displays for them. Beyond that, you can also create multiple separate listings, each with different users. Profile Builder gives you a few different options to let people search and filter your member directory. Profile Builder includes a detailed in-dashboard templating system that lets you control exactly how users are displayed on both the full user list and individual user pages. These tags also let you control the search box, faceted menu, pagination, etc. Speaking of pagination, you can control how many users to display per page, as well as the default sort criteria and order. Profile Builder has integrations with other popular plugins to help you display outside information in your member directory. You’ll also be able to include this information in the search or in your faceted menus. Profile Builder has a free version at WordPress.org, but you’ll need the Pro version for access to the member directory functionality. Check out this detailed documentation for a deeper look at all of the user listing features. ProfileGrid is a member directory plugin that’s also focused on helping you create an active social community. To that second part, you also get features like user groups, friend requests, private messaging, etc. As for the member directory part, you can easily create member directories for all your users, or for users in specific groups. Or, you also get an overall “Search users” page that lists all your members. If you like that social functionality, this might be a good option. But it’s overkill if you’re not planning on creating an actual community. I’ll combine the Filtering and Search options and Templating and Pagination subheads for this one because you don’t have quite as much flexibility. There are two kinds of member directories that you can create with ProfileGrid. Each user also gets their own detailed profile, which is one of ProfileGrid’s strong points. However, you don’t get many options for customizing how these pages work – so you’ll need to like the default functionality. ProfileGrid has integrations for WooCommerce and bbPress, but you don’t get the same ability to insert data from those plugins into your member directory. It’s more about integrating ProfileGrid’s profile system with those plugins. The core ProfileGrid plugin is free at WordPress.org. After that, the Pro version starts at $79. UserPro is a premium WordPress user profile and member directory plugin. Where this tool does well is the frontend display part. It comes with a few different premade member directory templates that, out of the box, look a little more “fancy”. So if you don’t want to use your own CSS and like the look of UserPro’s templates, that might be one tick in its favor. However, it’s not quite as flexible on the backend when it comes to controlling search and filter options or editing those templates. Like ProfileGrid, UserPro also comes with a number of social network-type features that, depending on your needs, could either be a positive or a negative. Beyond that, UserPro has lots of general user profile plugin features, like frontend registration forms and custom profile fields. You can also use shortcode parameters to add basic filters. You’ll add additional shortcode parameters to define each filter option, though you don’t seem to be able to control how those filters actually work. Overall, though, you’re pretty reliant on the plugin’s presets, whereas some of the other member directory plugins let you create your own template from scratch. UserPro has integrations for BuddyPress and WooCommerce to sync profile fields, though there doesn’t seem to be an option to show these in the overall member directory. The core UserPro plugin costs $39 at CodeCanyon. Beyond that, there are also additional add-ons you might need to purchase. For example, the WooCommerce integration will cost you another $14. As you can probably glean from the name, Simple User Listing is a super simple option for creating a WordPress member directory. Basically, it gives you a single shortcode that displays a full list of your site’s users. That’s it! To control that shortcode, you can use a variety of parameters. By default, Simple User List adds a search box to the frontend output, along with the list of users. However, there are no frontend filters. One thing you can’t do with this plugin is control how the outputted list looks from your dashboard. That’s actually the developer’s intent! Instead of relying on a graphical interface, you’ll need to copy the sample theme template part and edit it yourself. Simple User Listing doesn’t have any built-in integrations – you’ll need to know your way around PHP if you want to try to set something up. Simple User Listing is 100% free at WordPress.org. amr users is a flexible option that’s a bit more focused towards technical users and developers. That is, while it gives you a lot of options, it’s not always the most beginner-friendly tool. Beyond the free core version, there are also various premium versions that can tack on more advanced functionality, which gives you a little more flexibility than Simple User Listing if you’re willing to pay. By default, amr users adds a frontend search box that your visitors can use. You can also add filters, though you’ll need the premium extension to do so. You can also insert information before/after fields. Beyond that, you can also choose how many users to display per page, as well as whether or not to enable pagination or just show the top X results. There’s no dedicated WooCommerce integration, though. The core amr users plugin is free. After that, you can purchase “amr users +” for $40, and individual extensions for ~$20 each. Or, you can grab a bundle of all the premium plugins starting at $250. If you specifically want to add a social feel to your member directories, you’ll want to look at ProfileGrid or UserPro. Otherwise, those plugins might not be the best options if you don’t want all that extra community functionality. If all you want is a WordPress member directory, you’ll want to look at Profile Builder, Simple User Listing, or amr users. Of those three, Profile Builder is the only one that gives you an in-dashboard templating system from which you have full control over what information to include in your directory and how to display it (including integrations for other plugins like bbPress and WooCommerce). Beyond that, it gives you the most control over how the search works, along with the option to create your own faceted menus, which is another unique feature. The post 5 Best WordPress Member Directory Plugins Compared (Hands-On) appeared first on Cozmoslabs. The post What’s the Best WordPress User Profile Plugin? 5 Options Compared appeared first on Cozmoslabs. 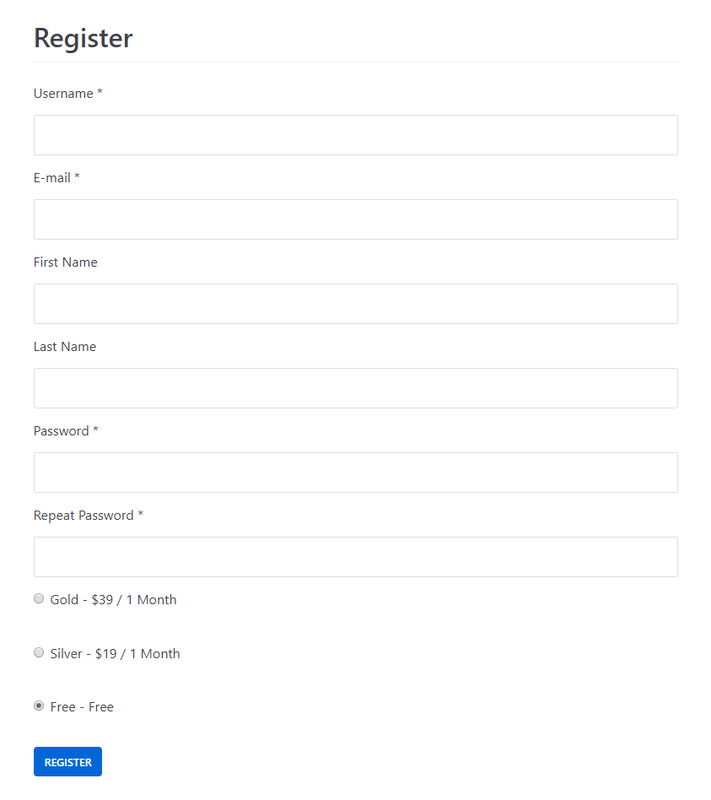 The post Edit Form Labels in Paid Member Subscriptions appeared first on Cozmoslabs. If you’re running a paid membership website, failed payments will reduce your revenue. On most WordPress membership sites, involuntary churn (resulted from issues such as failed payments rather than direct cancellations) has a significant impact on growth. Paid Member Subscriptions is a membership plugin that makes creating subscription plans and accepting payments a breeze. It’s also integrated with WooCommerce, allowing the admin to restrict product purchase or offer discounts to members. In order to make it really easy to see the reason for a failed subscription payment, for each payment that the plugin registers you’ll have access to a detailed log. As you notice we log payment failures but also different actions performed through the payment process, depending on the payment gateway. Besides the specific steps a user takes when trying to complete the payment, in case something goes wrong, we’re also saving the error message and displaying it. By clicking “View Details” under a certain log, you can see the full details of a certain payment error. Here’s an example of an insufficient funds error thrown by Stripe. Or, in case you’re using PayPal Standard, you’ll be able to view the IPN response details. Now that you have a clear picture on how Payment Logs look on the admin side, let’s move to the user (front-end) side. In the front-end, in case of a failed membership payment, we’re displaying errors to the user for any payment methods that do not require IPN activation. That’s because this ads an extra delay in processing/completing a payment. In our case this means PayPal Standard. Failed payments error messages are displayed for Stripe, PayPal Pro & Express. We’re displaying this message to the user and directing him to retrying the payment. This message is customized to have him complete the payment in as few clicks as possible. If the user is logged in, the message will also include a link that will take him to the Retry Payment form. Failed payments are part of running a membership site. They happen. However, troubleshooting failed payments on your membership site is much easier when you have a clear picture of what went wrong. This way both you and your users can take steps to fix it. Payment Logs for Paid Member Subscriptions will give you a clear picture of each step a payment goes through and where it got stuck. It’s a great debugging tool, that will help you act fast and recapture as many of those payments as possible. You can check out this functionality by trying the Paid Member Subscriptions demo. The post Troubleshooting Failed Payments on Your Membership Site appeared first on Cozmoslabs. Setting up a pricing table for your membership site is an efficient way to highlight each subscription plan’s features and make it easy for potential customers to compare the available options. A well thought membership pricing table can positively affect your site conversion rate. For each subscription plan, you’ll be able to set a price, duration as well as renewal type. After entering each subscription details, you’ll see an overview of all plans as well as their ids (we’ll be using these later). Now that we have created the subscription plans, let’s proceed with creating a registration form. This is done simply by placing the [pms-register] shortcode inside a page. It will output a registration form that allows users to purchase your subscription plans. Next, all that’s left is creating the pricing table for the existing subscription plans. We’ll be using a free pricing table plugin, Easy Pricing Tables. There are plenty of options, so feel free to choose the one you like. After installing the plugin, under “Pricing Tables”, click “Add New”. 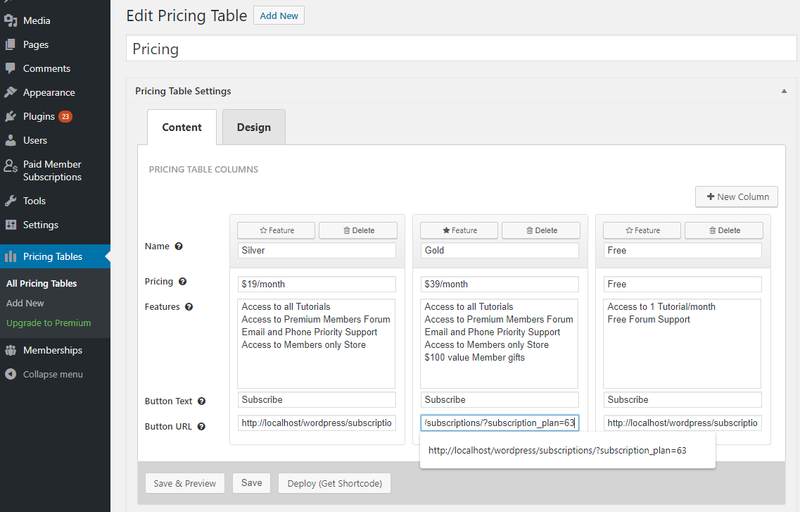 Make sure to set up a column for each subscription plan and give it a proper name, price, description and feature set. The most important detail is the URL that is set for the signup button of each column. 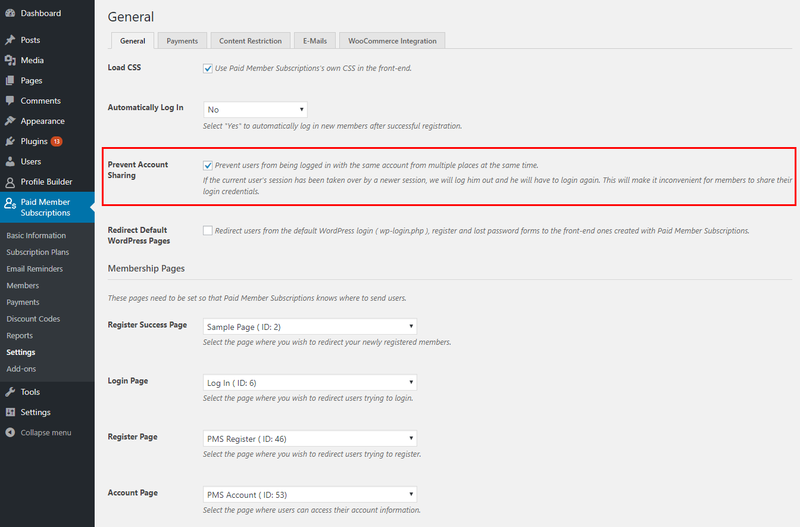 Paid Member Subscriptions allows you to pre-select a subscription plan through an URL parameter. In our case, let’s say the URL of the Register page (containing the register form created above) is: https://example.com/register. If we want to pre-select the Gold subscription, the link to pre-select this plan would be: https://example.com/register?subscription_plan=63. Note: “63” is the ID of the “Gold” subscription plan which can be found under the “Subscription Plans” list in Paid Member Subscriptions admin menu. Lastly, let’s create a page called “Pricing” and place the pricing table on it. 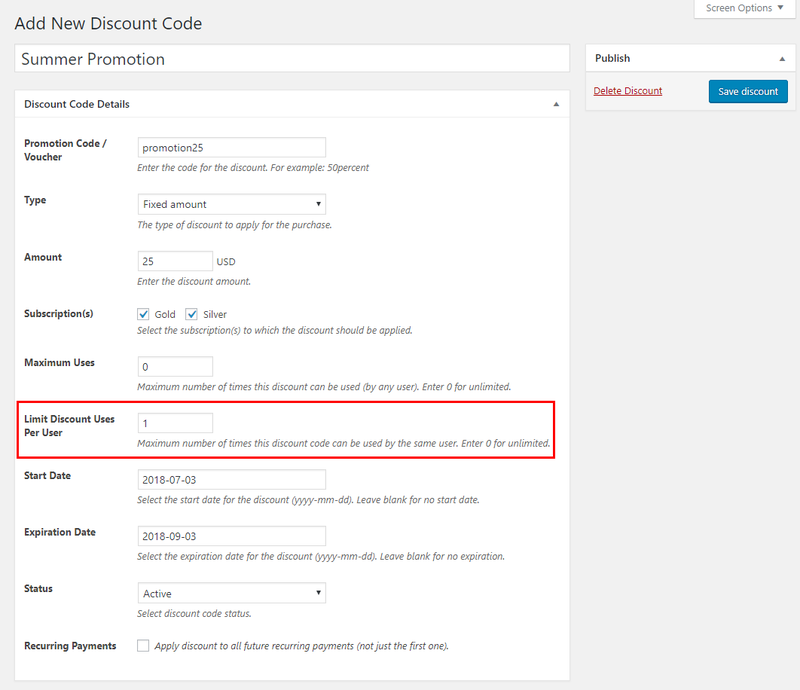 By clicking the “Get Shortcode” button after entering the table details, you can copy and paste it inside the Pricing Page. Now you can beautifully present each subscription plan details, allow potential subscribers to compare them as well as encourage them to sign up for a specific one. 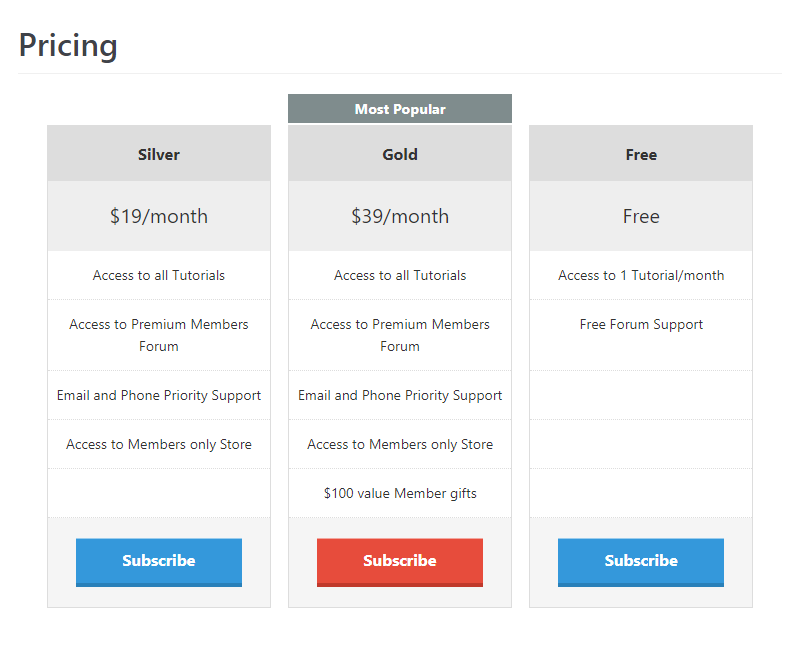 The post How to Create a Membership Pricing Table in WordPress appeared first on Cozmoslabs. If you’re a membership site owner, having an easy way to prevent account sharing will protect your revenue and increase your subscriber base in the long term. There are of course multiple ways to tackle the login credentials sharing problem. From adopting only social login as a method of authentication, to limiting the number of sessions, MAC or IP addresses a member can use when accessing your paid resources. None of them is bullet proof. The main idea is to make it inconvenient for a member to share his password, so that it’s not worth the hassle. That’s what we aimed for when implementing the ability to prevent account sharing in Paid Member Subscriptions. We wanted something simple, that will do the job in most cases. The simplest way to tackle this issue is by blocking concurrent logins. Using this setting you’re preventing users from being logged in from multiple places at the same time. If the current user’s session has been taken over by a newer session, we will log him out and he will have to login again. Think about it. It’s pretty annoying to find yourself logged out by someone to whom you gave your password. Of course, you can log in again, but if this goes on, it can be quite unpleasant. This will make it inconvenient for members to share their login credentials. Do you already prevent account sharing on your membership site? If not, make sure to give Paid Member Subscriptions a try. This option is part of the free version as well. The post Prevent Account Sharing on Membership Sites appeared first on Cozmoslabs. The post Limit Discount Code Uses per User in Paid Member Subscriptions appeared first on Cozmoslabs. We are happy to announce the release of the Edit Profile Approved by Admin Add-on for Profile Builder. 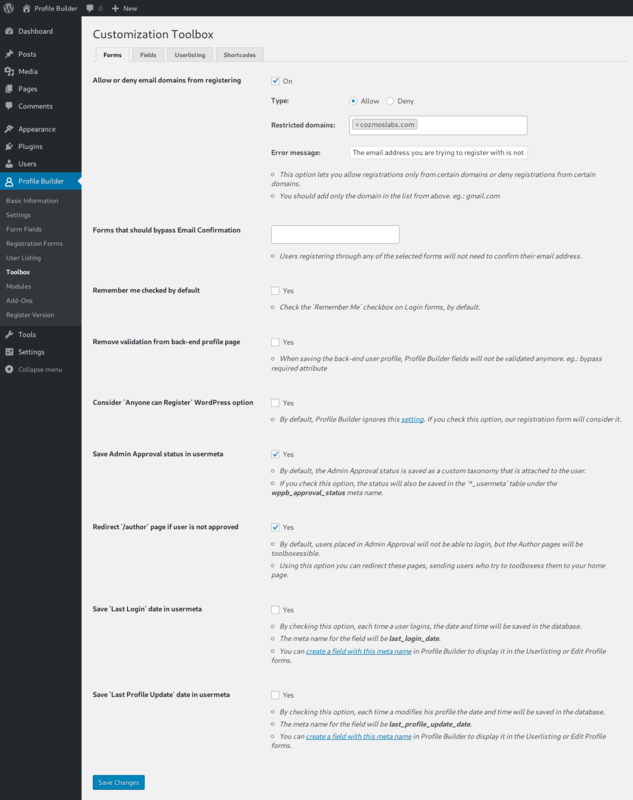 The Add-on extends the functionality of Profile Builder by allowing administrators to approve profile changes made by users on individual fields. Until the fields have been approved the old values will be displayed for everyone else. You can simply activate admin approval on a field by clicking the “Requires Admin Approval on Edit Profile” checkbox. After a user updates his profile and if fields that require admin approval have been modified, those fields will be marked accordingly (yellow background and a description) and also will be notified at the top of the form. Administrators have a couple of extra options on the edit profile forms, after activating the addon, that will allow them to filter users that require approval and approve individual fields. The post Admin Approval on Edit Profile fields with Profile Builder appeared first on Cozmoslabs. It’s a global world, and if you want your website to be ready to greet people who speak different languages, you’ll need a WordPress translation plugin. Translating your WordPress site is a big endeavor. This isn’t like swapping out one contact form plugin for another – you really need to dig in and make sure that you’ve picked the right long-term solution before you put hours and hours into translating your WordPress site. To help you pick the best WordPress translation plugin for your specific needs, we created this comparison. We’ll start with some quick tips on what to look for in a WordPress translation plugin to help frame the rest of the comparison. Then, we’ll dig into 5 of the best translation plugins to help you create a multilingual WordPress website. To help you pick the right plugin for your needs, you should start by answering these two questions. First – how do you want to actually translate your content? That is, are you planning to manually translate every single word (or hire a professional translator)? Or, would you rather have a machine do it (think Google Translate)? Manual translation ensures perfect accuracy, but it’s time-consuming if you do it yourself, and it can be expensive if you outsource it to a professional. Automatic translation saves time and money, but it’s not perfect, so you might have mistakes unless you manually review all the translations. Second – what’s your preferred interface for managing your translated content? Some plugins will give you more of a basic .po editor-style interface – it looks like a table with the original text on one side and the translated text on the other. Others will basically let you create two separate versions for each piece of content. And finally, some will give you more of a visual interface where you can manage your translations by clicking on a live view of your site. Once you’ve thought about the basic approach that you prefer, you should also thoroughly check these two important bits of functionality. First, there’s translation completeness. That is, does the translation plugin let you translate 100% of the text at your site? There’s a lot that goes into your WordPress site’s content beyond just the text in the WordPress editor. You have menu items, sidebar widgets, SEO plugin titles/descriptions, plugin content output from shortcodes…you get the idea. Some translation plugins are better than others at making it easy to translate every little bit of your site. Then, there’s also SEO. If you want your site to rank, you’ll need to make sure the plugin creates an indexable version of your site for each translation. You’ll also want to make sure that you can control URL slugs and SEO titles and descriptions for each translation version. Translator accounts if you want to give a freelancer access to your site. Connections to third-party translation services if you want to outsource translations. 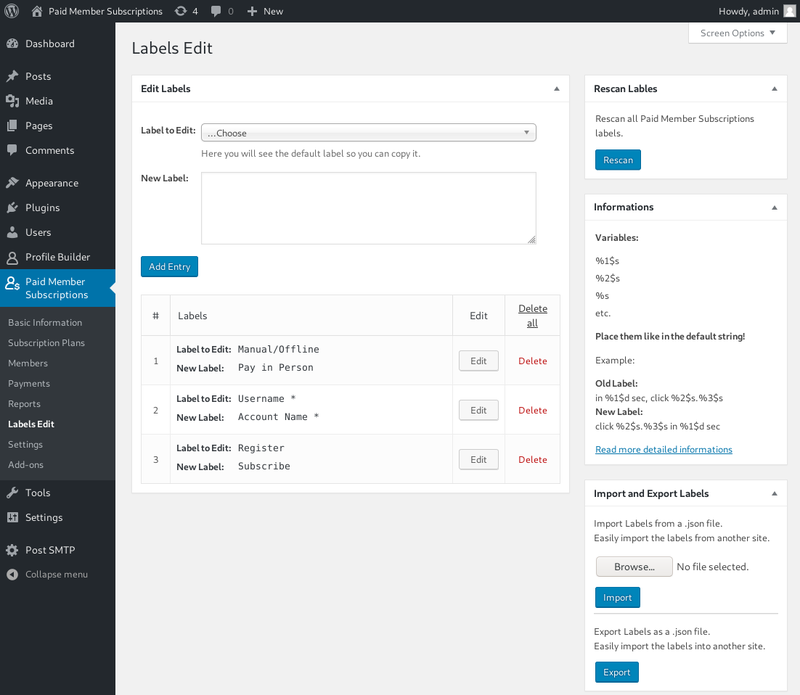 Editorial control to manage which content has been translated so far. Plugin integrations (e.g. WooCommerce support). While we’ll try to cover as much as possible, we can’t investigate smaller features like these without turning this post into a book. TranslatePress is a free translation plugin that also comes with a premium version that tacks on extra functionality. It offers an intuitive visual translation interface that lets you translate all your content directly from the front-end, using an interface that looks a lot like the WordPress Customizer. Plus, it won’t slow down your site. It lets you use both manual translation or automatic translation via Google Translate. Unlike some of the other visual translation tools that you’ll find on this list, TranslatePress is GPL-licensed and self-hosted. That means you’re never locked into monthly fees just to use the plugin, and all your translations stay in your own database. On the left side, you’ll be able to manage and edit translations for individual strings. And on the right side, you’ll see a live preview of your site. Use the drop-down at the top to select (or search for) specific strings. Click on any string on the page to edit it like that. Beyond selecting specific strings, you can also edit entire paragraphs, which can help save you time. For your site’s design, little things like where a line breaks matter, so being able to quickly preview different translations helps ensure that everything looks pixel-perfect for every language. And the Pro version also lets you create separate translator accounts at your site. Another one of TranslatePress’ big selling points is that it lets you translate everything on your WordPress site. As you can see, you don’t need any special tricks or a separate interface – you can translate 100% of your content without leaving the normal editing interface. There’s also a feature that lets you preview your site as different user roles which helps you translate dynamic content (e.g. restricted content at a membership site). TranslatePress is fully SEO-friendly. Here are a few of the features that you get to help your site rank. Currently, there’s no support for subdomains, but there is a free add-on that lets you encode the language as a GET parameter. All the links automatically adjust to go to the proper language version, as well. The premium plans start at €79 or €139 depending on what features you need. WPML is a long-standing WordPress translation plugin that offers a more traditional approach to translation. By default, WPML only supports manual translation, and it does so using a non-visual .po editor-style interface. WPML also makes it easy to connect to third-party translation services, which gives you a roundabout way to automatic translation. WPML gives you a few different translation interfaces, depending on whether you’re working with an individual post or general theme content (like widgets and menu items). Depending on what content you’re editing, you can also use a side-by-side .po editor-style interface to edit post content. For example, if you’re editing page builder content, you’d go string-by-string through that interface, rather than recreating your page builder design. …or the Taxonomy Translation interface for categories and tags. WPML lets you translate most of your content, but it’s spread out into different interfaces, which might take you a little longer to figure out. Additionally, it can struggle with translating dynamic content or AJAX content, which might cause issues for certain sites. Additionally, it makes it easy to edit SEO metadata or slugs because you’re essentially working in the normal WordPress editor when you translate content. There’s no free version of WPML. The cheapest version of WPML starts at $29, but it’s limited in what content it can translate. As a result, most users will need the $79 Multilingual CMS version to effectively use WPML. By the numbers, Polylang is the most popular WordPress translation plugin that’s listed at WordPress.org. By default, Polylang only supports manual translation. However, it’s also built to work well with the Lingotek plugin from the same developer. This separate plugin gives you access to automatic or professional translation. You’ll also work in a few other areas. For example, you’ll create separate menus for each language using the native WordPress functionality. Polylang will let you translate most of your site. But depending on what content you have, it might not be the most efficient way. For example, if you want to translate content that you’ve built with a page builder, you’ll need to “rebuild” the page builder design for each translated piece of content, which isn’t very efficient. In contrast, something like TranslatePress would let you go in and just edit the text content, even if you built something with a page builder. Additionally, there are some omissions, like the ability to translate theme strings. To fix this, you’ll need another third-party plugin like Polylang Theme Strings. Additionally, because you’re creating “new” content for each translation, you’re able to edit metadata information for each translation, like your Yoast SEO settings. If you want to create complete translations, you might need the premium version depending on your site. For example, the Pro version is required if you want to translate custom post type slugs. Unlike the previous three translation plugins, Weglot is a hosted SaaS-style translation service. The benefits of this approach are that you can create an automatically translated website in just a few clicks – it really is that simple. But the downside is that all of your content is stored in Weglot’s database, and you’ll need to pay an ongoing monthly fee for as long as you want to use the Weglot service. To get started with Weglot, you’ll first need to connect your Weglot account to your WordPress site by entering an API key. After that, Weglot will automatically translate your website right away. Then, you can go in and manually edit those translations using the Weglot cloud interface (that is, you won’t be working in your WordPress dashboard). In the cloud interface, Weglot gives you two different ways to manage your translations. One nice thing here is that you can easily see whether each automatic translation has been reviewed by a human editor yet. Through the years of doing support for our WordPress plugins we received numerous requests for little features or customizations that our clients wanted. All of our products make use WordPress actions and filters, so for many of the available functionalities, you can change the outcome or modify it to your liking using a hook. While searching for and using hooks isn’t a problem for users with developer experience, our customer base is large and has different qualifications. There’s always the option to keep on adding extra options and settings in the plugin, but because we want to keep our plugins clean and simple, we decided against cluttering the interface. Most of these customization requests were handled through snippets of custom code that we sent to our users who were requesting them. This approach was not ideal, because not everyone would be able to benefit from them, so we wanted to make them available to more users. Thus, the Developer Knowledge Base area of our documentation was born. This page helped our users a lot, but manually adding the code to your website and modifying parameters or messages from a function wasn’t exactly natural and comfortable for everyone. Now we take this a step further by providing an interface for these popular customizations through the Customization Toolbox add-on for Profile Builder. The first release will cover Profile Builder, but we are working on providing a similar add-on for Paid Member Subscriptions. The add-on is Free and works with any version of Profile Builder. The available options might differ based on the Profile Builder version you are running (Free, Hobbyist or Pro). To download it, go to the add-on page and then manually upload the archive on your website by going to Dashboard -> Plugins -> Add New. After you activate it, you’ll be able to find the settings under the Profile Builder menu, by going to the Toolbox page. The available options are organized in a tabbed interface. Most of the options will only need you to enable them, while some others are requiring extra settings. You can check out the documentation page here. The add-on is in no way comprehensive and cannot cover all aspects from the plugin, but it strives to do so. We are also looking to expand it in the future by adding more features. The post Profile Builder Customization Toolbox appeared first on Cozmoslabs.